Florida continues to be one of the top destinations on the planet for vacationers due to two commodities that have always worked in Florida’s favor: an abundance of sparkling sunshine and warm weather. It seems that no matter what your location in any region of Florida, it’s always within close proximity to some of the best beaches in the world, spectacular entertainment, excellent dining options, and unlimited outdoor activities — for kids, young adults, mature adults and retirees. However, the state’s image has taken a beating after the housing market crash and subsequent recession. After some hesitation, many real estate professionals, economists and market analysts throughout Florida finally agree that the current condition of the Florida real estate market signifies recovery mode. 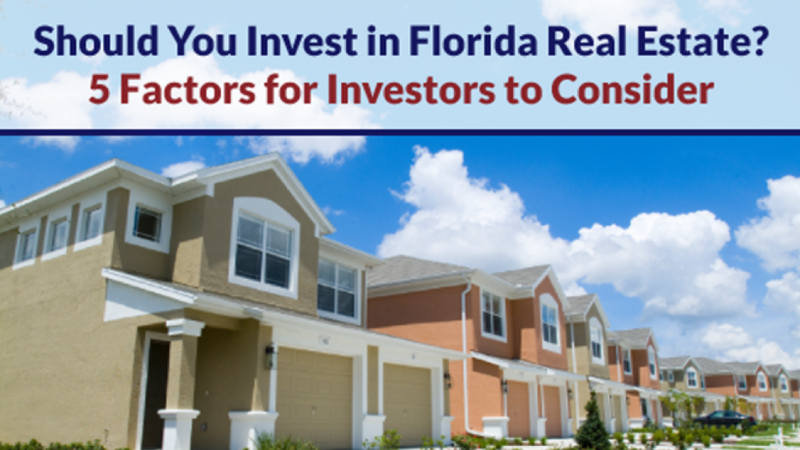 Whether you invest in a Limited Liability Company (LLC) for “buy-and-hold” investments, flip real estate in an S Corporation, or invest in REITs that specialize in Florida, it makes sense to invest in Florida real estate for a variety of reasons. Investors not only gain leverage when you finance the property with the bank’s money, but you can also use multiple strategies to reduce, defer or eliminate taxes, while creating a tax-free cash flow. While nothing is guaranteed when it comes to investing in real estate, data from regions throughout Florida — from the Panhandle to South Florida — shows that the state has a bright economic future. 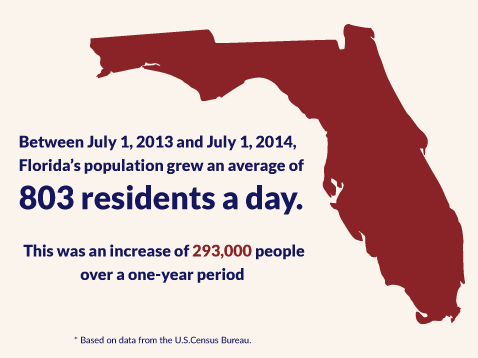 Between July 1, 2013 and July 1, 2014, Florida’s population grew an average of 803 residents a day. This was an increase of 293,000 people over a one-year period, based on the latest data from the S.Census Bureau. Florida now has a total population of 19.9 million and usurps New York as the third most populous state in the union, behind California (1) and Texas (2), respectively. The state has a robust state economy that revolves around the service sector, particularly trade and tourism. The private sector has a growth rate of 3.4 percent, which ranks only behind Texas. Ted Jones, chief economist and senior vice president for Stewart Title Guaranty Company, spoke at the Midwinter Business Meetings at the Renaissance Orlando Resort. He says that Florida job growth could reach 2.2 percent to 2.4 percent in 2015. UCF predicts a more conservative rate of two percent. Many analysts also forecast that Florida will outpace the national average in key areas of the economy, including new home construction, payroll job growth, personal income, retail sales, and gross domestic product. Adding to this rosy outlook for Florida’s economy, economists project a surplus of $1 billion in 2015. The current condition of the Florida real estate market reflects a return to the normal trend lines, as the market has regained its balance and becomes stronger. Real estate listings, which have trended up for several months, have replenished the inventory of homes to the traditional 5 to 6 month supply level. Yun describes the real estate market as encountering “some degree of recovery,” which should continue for the next 2 or 3 years to reach the price level of 2006-2007. This will occur before the market moves into the expansion phase of the business cycle. An influx of new residents who will be looking to buy homes. Lenders who will ease the credit standards and qualify more buyers. Former homeowners who lost their properties in short sales and foreclosures will re-enter the home buying market. UCF predicts that new housing will have year-over-year increases, escalating from 111,500 units in 2015 to 150,500 units in 2017, before it starts to level off. After experiencing double-digit appreciation the previous year, the median sales slowed to 5.3 percent in 2014, based on data provided by the Florida’s Realtors. Going forward, investors should expect home price appreciation closer to the historic rate of 3 to 4 percent. Foreclosure-related activities have increased, based on data provided by the RealtyTrac year-end U.S. Foreclosure Market Report. 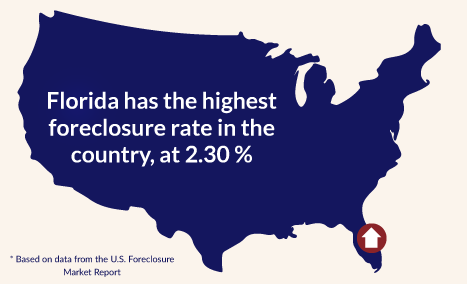 It shows that Florida has the highest foreclosure rate in the country, at 2.30 percent, as well as the second longest foreclosure process at more than 900 days. Much of the increased activity has to do with cases finally moving through the system. The Millennial generation, otherwise known as Gen Y, has received quite a bit of attention lately, with a 4 million household formations expected by 2025. Economists look to this group to fuel a sustained recovery. However, individuals should not be so quick to discount the baby boomers. Many members of the baby boomer population have gotten over the shock of seeing the value of their stocks and homes plummet when the market collapsed. They have regained some of their lost equity, downsized, and moved to warmer climates where the cost of living is low and their retirement dollars will stretch further. The change of lifestyle adds to the previously-owned housing inventory, where many of the first-time, millennial home buyers choose their home. The sellers become renters and home buyers in the areas where they relocate. As Boomers move out of their homes, it makes inventory available for millennials and other first-time home buyers. Boomers are also renting and buying homes in the areas where they relocate and they prefer towns with low housing costs and a low rate of appreciation. Millennials have an inclination to relocate to towns that have high rental rates and high home price appreciation. As far as mortgage interest rate increases, mortgage rates are expected to rise in 2015 but will stay near historic levels, and have minimal effect on home buyer decisions. Foreign investors have always had a preference for the United States because of its political system and stable economy. The U.S. property market continues to provide the characteristics required for real estate investment for domestic and offshore investors. Florida remains the number one destination for international home buyers. Orlando ranks number two for the most-searched city on the Realtor.com website, followed by Miami at number four and Fort Lauderdale at number eight. Since 2009, international buyers have purchased more than 250,000 properties in Florida, investing a total of more than $50 billion. Investors from Germany, United Kingdom, Sweden, Australia, France, Italy, China and Switzerland are among the top buyers for U.S real estate. Florida’s proximity to Latin America also makes it a haven for deep-pocketed investors from Argentina, Venezuela, Columbia and Brazil. People who invest in Florida real estate have changed their primary investment objective from an interest in cash flow investment properties, to a strategy that focuses on low real estate prices and potential equity growth. Florida offers all of the traditional elements foreign buyers look for when investing. Combined with low interest rates and strength of foreign currency against the U.S. dollar, financial assistance simplified the purchasing process for foreign national investing in the state. In 2014, a total of $366 billion of inbound investment flowed into U.S. real estate. Led by New York City with $49 billion, Miami came in 12th place with $6 billion. Approximately 23 percent of all sales transactions with foreign nationals took place in Florida. Without a doubt, foreign capital has helped stabilize Florida’s real estate by driving demand and exerting upward pressure on home prices. In fact, some areas of the state have experienced bidding wars, especially in the South Florida market, because of the competition between investors and between investors and home buyers. Florida’s commercial real estate market also shows excellent strength in Florida and across the nation. At a recent conference, Richard Barkham, the Chief Economist CBRE, states that despite naysayers Florida is seeing tremendous growth in the economy and the commercial sector, driven by population growth and an increase in tourism. Not only has the demand increased for commercial and residential properties, but the steady flow of defense-related contract has also created an insatiable demand for office space. Barkham said that multi-family housing, retail spending, and demand for warehouses, distribution centers and office space will be in demand. The NAR also agrees that the commercial market has sound characteristics, especially the warehouse sector. Portfolio diversification — The return on investment has a direct connection to the rent received from tenants. Investment real estate represents an important component of a diversification strategy as it relates to asset allocation. Typically, real estate has a low correlation with other asset classes like stocks and bonds — meaning real estate doesn’t move up and down with the other investments. Increased value and improved performance — The estate owner has more control over the overall performance of the investment. The owner can enhance the appearance of the property to increase its value, or find higher quality tenants as leases expire. Depreciation deduction — One of the main reasons for the popularity of directly investing in real estate involves the depreciation deduction. This rule may allow an investor to generate more current tax savings than the outlay allocated to principal repayment on the loan. A hedge against inflation — Real estate investments can function as protection against inflation. Some leases contain clauses that allow the landlord to link the rent to an inflation index or increase rental rates whenever a lease term expires and the tenant renews the contract. Florida provides one of the best opportunities for real estate investment anywhere in the United States. Many people invest in Florida real estate for different reasons — to create a “forced retirement plan,” to build up future cash flow and wealth, to take advantage of write-offs against other income, or risk management for their investment portfolio. Regardless of the reason for investing in Florida real estate, the task requires knowledge and due diligence. If you would like to learn more about buying or selling property in Florida, call 1.885.831.4242 to get in touch with a Florida Real Estate Broker at Fortna Auctioneers & Marketing Group. We are Commercial Real Estate Auctioneers with years of experience selling commercial, premier residential and luxury real estate. Download our brochure for more information.